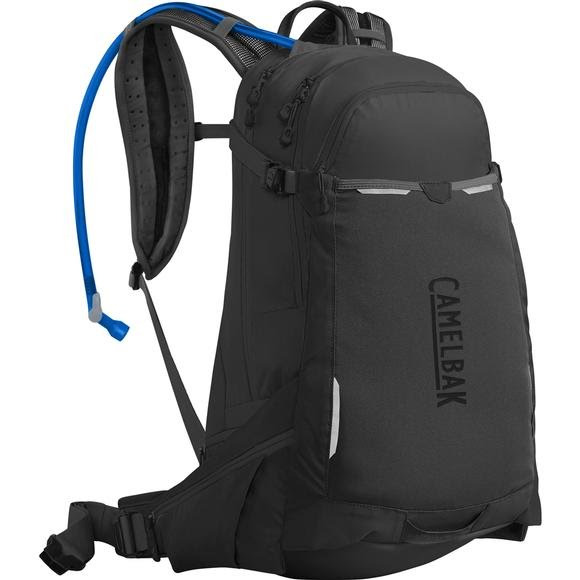 Maximum storage, maximum hydration, and a lower center of gravity: Camelbak's H.A.W.G. LR gives you all three. The LR or Low Rider technology offers a lumbar reservoir design that shifts weight from your shoulders to your hips for more stability, making it the preferred choice for long days in the saddle. Maximum storage, maximum hydration, and a lower center of gravity: Camelbak &apos;s H.A.W.G. LR gives you all three. The LR or Low Rider technology offers a lumbar reservoir design that shifts weight from your shoulders to your hips for more stability, making it the preferred choice for long days in the saddle. The Flow AC back panel combined with the well padded, but perforated harnesses maximize comfort and ventilation even when filled to maximum capacity. It can also hold a second reservoir for the most epic days. There&apos;s additional tool storage and a magnetic tube trap so you can drink without taking your eyes off the trail. Extra storage on the harness and waist belt keep essentials close at hand and the universal helmet hooks make it easy to carry your helmet when not riding. If you encounter harsh weather, the integrated rain cover can quickly shield your gear.